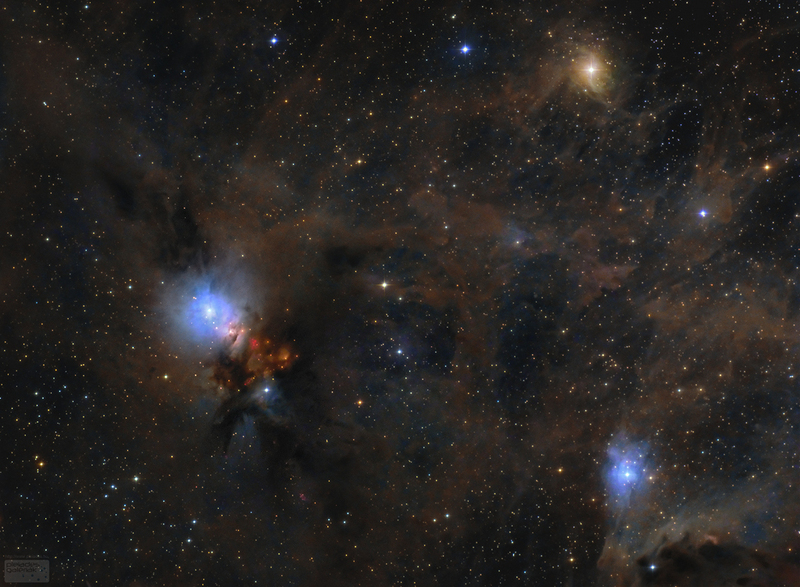 Image Credit & Copyright: Lorand Fenyes Explanation: Clouds of stardust drift through this deep skyscape. The cosmic scene spans nearly 2 degrees across the Perseus molecular cloud some 850 light-years away. A triangle of dusty nebulae reflecting light from embedded stars is captured in the telescopic field of view. With a characteristic bluish color reflection nebula NGC 1333 is at left, vdB13 at bottom right, and rare yellowish reflection nebula vdB12 lies at the top. Stars are forming in the Perseus molecular cloud, though most are obscured at visible wavelengths by the pervasive dust. Still, hints of contrasting red emission from Herbig-Haro objects, the jets and shocked glowing gas emanating from recently formed stars, are evident in NGC 1333. At the estimated distance of the molecular cloud, legs of the triangle formed by the reflection nebulae would be about 20 light-years long.